As of early 2018, I have fundraised on behalf of the National Alliance on Mental Illness Massachusetts (NAMI Mass). A variety of conversations with mental health professionals since 1999 have led to my NAMI fundraising exercise which is a work in progress. The reason I am sharing a section of my failures is to provide a more humane and balanced view of who I am and not the perfectionist I might sometimes set out to be. The idea of writing a failure biography was recommended at a lecture I attended by Michael Fairbanks, a Returned Peace Corps Volunteer at Phillips Academy Andover, in which he urged social entrepreneurs to disrupt themselves. When Tariq was 9 years old he was given a pair of roller skates as a birthday gift from his parents. He immediately wanted to roller skate, but kept falling and this was his first lesson in failure. This laid the foundation for a multitude of personal and professional failures. Despite having lived and studied in international settings, his next series of failures came when trying to learn foreign languages. Unable to focus on one language, Tariq was unsuccessful in developing proficiency in Hindi, Assamese, Arabic, French, Spanish or Tamil. Till today, he is unable to speak, read or write any foreign language fluently including Malayalam, his mother tongue. Tariq’s high school career lacked any significant academic accomplishments. While in boarding school in India, he was too busy sneaking out of the dorms, drinking rum and coke and chasing girls. He chose to leave boarding school and finish his high school years in the UAE, under the close eye of his parents. When it came time to apply to colleges he was restricted in his choices. An Ivy League university education was out of the question because he barely scored above 1000 on his SATs. In an attempt to diversify his extra-curricular activities, he took guitar lessons but by the end of the course could hardly read music. His college career was further limited because he initially wanted to be an Economics major, but had to switch to Government after almost failing 2 Economics courses. Thinking he could get away with the poor grades, he received consistent rejections by investment banks and consulting firms who scoffed at his 2.5 GPA. During his college years, his experimentation with drugs and alcohol did not help his academic career. After graduating from college, Tariq was to start his corporate career with a Fortune 500 company, but had a psychotic episode in New York City where he was hospitalized in 1999. Since then he has been taking anti-psychotic medications as well as undergoing psychotherapy and cognitive behavioral therapy with a team of highly empathetic mental health professionals. In hoping to counter his psychological distress and significant weight gain, Tariq took a job as a squash coach. His hopes were quickly deterred when one of his students broke down in tears due to his lack of attention. His professional career has been marked by mediocre performance reviews. Not long after securing his second corporate position he was unable to meet his supervisor’s expectations, which almost led to him being fired. Nonetheless, he was forced to resign and soon after experienced his second psychotic episode in 2005, when he had stopped taking his medication. His medication dosage was increased by over 200 percent and soon his weight exceeded 200 pounds. His inability to hold down a steady job and his psychological imbalance has led to a life of dependence. To date, the majority of his adult life has been spent living with his parents since he cannot afford to live on his own. He continues to lead a life of laziness, as he does not cook, clean or do yard work. In the future, Tariq hopes that no one else will have to live through a psychotic episode or any related mental illness*. He believes, his failures are his successes turned inside out. * Note: This failure biography will change over time just as the language on persons with disabilities has in the United States. Since this is a blog with many words, I thought it was important to share a poster (please click on photo to read categories) on the “Evolution of Disability Language in the United States,” to give consideration to the spectrum of people with mental health issues. 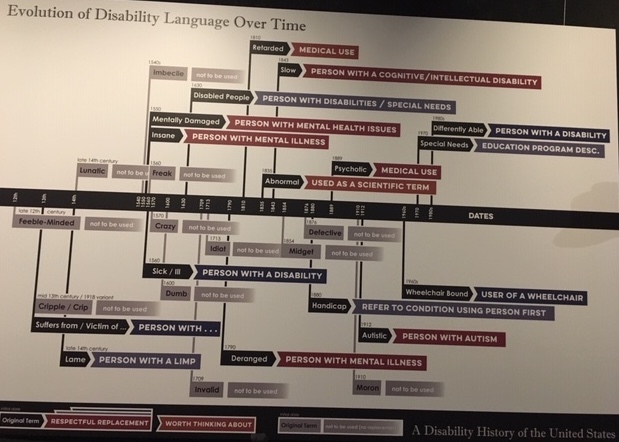 Evolution of Disability Language in the United States: A History of Disability in the United States, Charles River Museum of Industry and Innovation, Waltham, Massachusetts. Photo credit: T. Mohammed, 2018.